Description PLEASE SEE PUBLICITY URL BELOW! $1,225 PRIZE FUND. OPEN and RESERVE (U1600) Sections are USCF-rated. 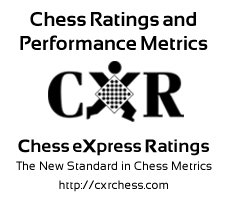 NOVICE (U1100) Section is CXR-rated. SIDE EVENT: SPEED G/5,d2 will be CXR-rated. Directions Garrison at Towson Ave/11th St.